Palestinians need to stop hating Israel & Israel must be recognised by the world. US President Donald Trump created more speculation this week, when he halted Washington’s quest for a two-state solution to the Israeli-Palestinian conflict, saying he would back a single state if it led to peace. The new president warmly welcomed Israel’s Prime Minister Benjamin Netanyahu to the White House and hailed the “unbreakable” bond between their countries. But even as Trump promised to pursue peace between the two sides, who have had no substantive peace talks since 2014, he offered no new ideas for unblocking the peace process. 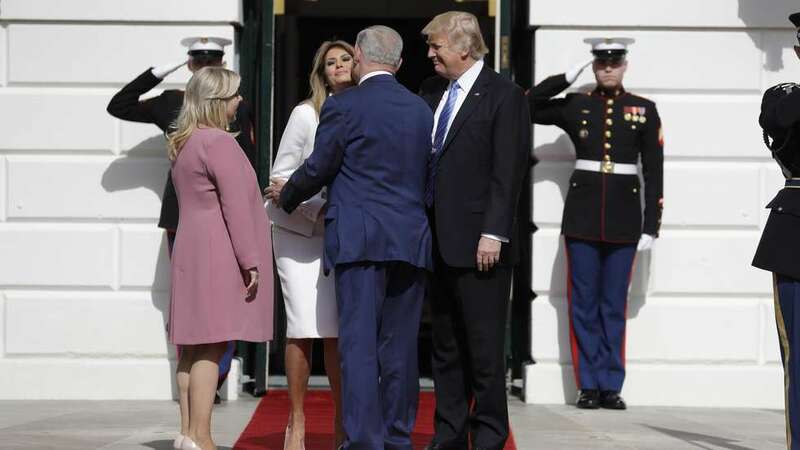 Setting a friendly tone, Trump greeted Netanyahu on a red carpet, which was rolled out to the White House driveway, a very special greeting reserved only for exclusive guests. The two leaders smiled, shook hands and chatted amiably before heading inside the executive office, accompanied by first lady Melania Trump and Prime Minister Netanyahu’s wife Sara. Among the questions that figured prominently on the agenda was the future of the two-state solution – the idea of creating a Palestine living peacefully alongside Israel. If this change in the US stance was calculated to please Netanyahu and his right-wing coalition, Trump’s views on the shortcomings of the Palestinian position will delight them. “I think the Palestinians have to get rid of some of that hate that they’re taught from a very young age,” he said, echoing Netanyahu’s argument that Palestinians are not ready for peace. The administration tried to soften the blow of Trump’s policy shift, a senior White House official said on Tuesday that peace did not necessarily have to entail Palestinian statehood. Palestinians responded by warning Trump that such a move would seriously damage U.S. credibility. Giving a vague, meandering response to a question on the issue, Trump suggested that he could abide by whatever path the two parties decided. “I m happy with the one they like the best,” Trump said. United Nations Secretary-General Antonio Guterres warned Wednesday against abandoning the idea of a two-state solution, saying there was “no alternative”. Netanyahu committed, with conditions, to the two-state goal in a speech in 2009 and has broadly reiterated the aim since. But he has also spoken of a “state minus” option, suggesting he could offer the Palestinians deep-seated autonomy and the trappings of statehood without full sovereignty. At the news conference, he never ruled out a two-state solution, but also made it sound as if it was an almost impossible. He said there were preconditions for it to happen, including the Palestinians’ recognition of Israel as a Jewish state and Israel retaining security control “in the area west of the Jordan River” – which would encompass all of the West Bank. Netanyahu and Trump shared several warm handshakes during the news conference, especially after Trump’s opening remarks, when he said the United States was Israel’s greatest friend. The two leaders agreed that there was an opening for enlisting Israel s Arab neighbours – who share its concerns about Iran – into any future peace process, though they offered no specifics on how that could be done. But a retreat from the principle of a two-state solution would cast doubt on the chances for cooperation from the broader Arab world. Palestinians reacted with alarm to the possibility that Washington might ditch its support for an independent Palestinian nation. “If the Trump administration rejects this policy it would be destroying the chances for peace and undermining American interests, standing and credibility abroad,” Hanan Ashrawi, a senior member of the Palestine Liberation Organization, said in response to the U.S. officials remarks. “Accommodating the most extreme and irresponsible elements in Israel and in the White House is no way to make responsible foreign policy,” she said in a statement. Husam Zomlot, strategic, adviser to Palestinian President Mahmoud Abbas, said the Palestinians had not received any official indication of a change in the U.S. stance. “It’s another nail in the coffin of the peace process, which already had a lot of nails in it,” said Martin Indyk, a former Middle East negotiator under Obama and now at the Brookings Institution think tank in Washington. The one-state idea that Trump referred to would be deeply problematic for both sides. One concept would be two systems for two peoples, which many Palestinians would see as apartheid. Another version would mean equal rights for all, including for Palestinians in an annexed West Bank, but that would compromise Israel’s Jewish character. For Netanyahu, the talks with Trump are an opportunity to reset ties after a frequently combative relationship with Obama. The prime minister, under investigation at home over allegations of abuse of office, spent much of Tuesday huddled with advisers in Washington preparing for the talks. Officials said they wanted no gaps to emerge between U.S. and Israeli thinking during the scheduled two-hour Oval Office meeting. Trump, who has been in office less than four weeks has constantly flowed in speculation, His foreign policy apparatus is in disarray following the forced resignation of his national security adviser Michael Flynn, brings with him an unpredictability that Netanyahu s staff hoped would not impinge on the discussions.